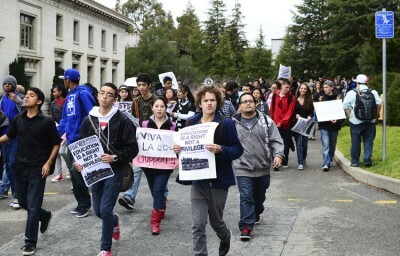 While the March 1 Day of Action at UC Berkeley garnered less participation than expected, demonstrations at UC Santa Cruz and UC San Diego were characterized by disruptions of the campuses’ normal activities. Protesters at UC Santa Cruz started the day early, effectively shutting down campus operations such as traffic in and out of the campus from 4:30 a.m. until around 5:30 p.m. And rallies at UC San Diego took an unexpected turn when a group of protesters occupied a conference room in the campus administrative complex in the afternoon. But the day’s protests extended beyond the scope of the state. 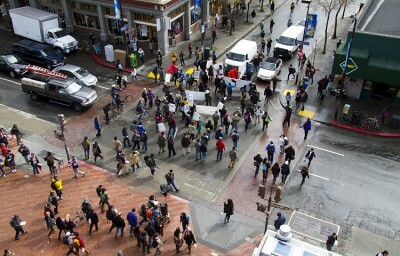 According to The Wall Street Journal, hundreds of Occupy Education demonstrators marched across the Brooklyn Bridge, while other protests occurred at the University of Pennsylvania and Ohio State University, among other locations. Brahinsky, who helped organize the protests, said about 1,400 demonstrators participated in the day’s events, which brought cafeterias, classes, libraries and even traffic to a standstill. Dozens of protesters stood at two of the main entrances to campus throughout the day, blocking all vehicles except emergency vehicles. Brahinsky said the blockades incited some instances of road rage, including a motorist who allegedly hit several protesters and caused them minor injuries. He said he nonetheless considered the day’s events successful, as protesters were able to set up a temporary “tent university” and brainstormed solutions to declining state funding. “Today’s action was kind of incredible in that we had even the people who were pissed (about the traffic disturbances) saying, ‘I understand completely what you’re doing,’” he said. But UC Santa Cruz freshman Jason Marrott said the protests were somewhat hypocritical. Although he supports the cause, he was frustrated that most of the libraries were closed because of the protests, as well as most of the campus cafeterias. In an email to students, UC Santa Cruz Chancellor George Blumenthal shared similar concerns. 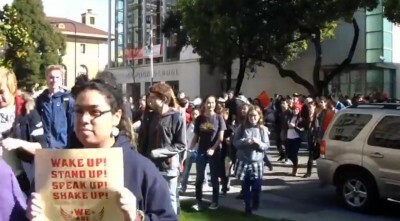 UC San Diego also began the day with rallies, but at around 3 p.m. a group of between 30 and 60 students entered and occupied a conference room in the campus’s administrative complex. Campus student government Vice President for External Affairs Samer Naji said the protesters handed administrative officials in the room a list of demands and planned to stay there overnight. But later in the day, a man dressed in plain clothes standing within the group raised suspicions among protesters, Naji said. After some probing, the man admitted to being a campus police officer but would not show his badge, according to Naji. 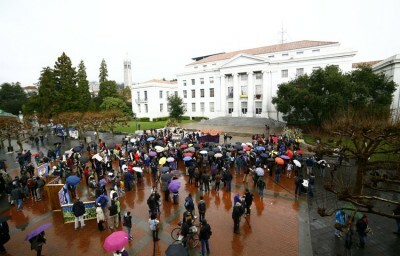 “They’ve been really hesitant to use UCPD to break up protests,” he said. Campus spokesperson Jeff Gattas said the presence of police officers in plain clothes at protests was not unusual. Damian Ortellado is the lead higher education reporter.